For the brownie: Preheat the oven to 300°F. Line an 8x8 inch mold with baking parchment. In a bain marie, melt the butter and mix with the cocoa and salt. Set aside. Beat the eggs and sugar in a large bowl until light. Add the melted butter with cocoa, flour and baking powder. Mix well and sprinkle in the chopped pecans. Pour the final mixture into the lined mold and bake for 40 minutes. The center should be still moist after removing. When ready, let cool over a wire rack before unmolding. This brownie can be stored for up to two days in a tightly sealed container. For the chocolate pudding: In a small pot combine the sugar, cocoa, flour and starch. Mix well, then add the egg yolks and milk in the center. Stir until evenly blended. Place the pot over medium heat, stirring constantly until the mixture has begun to thicken. When thick, turn off the heat and incorporate the butter and vanilla. Stir well before transferring to separate bowl to cool. Store in the refrigerator covered with plastic film to prevent a ‘skin’ from forming over the surface. This pudding can be made the night before to cut down on prep time. For the whipped cream: Beat the cream with the sugar until light and fluffy. Mix in the vanilla and refrigerate immediately. Be careful to not over-mix or the the cream will change into butter. To assemble: Cut the brownie into 1x1 inch cubes. Using individual dessert glasses (or a footed bowl), fill each base with chocolate pudding. Place various brownie pieces on top. Cover with a layer of whipped cream before adding more chocolate pudding. Continue to layer until finishing with whipped cream on top. Garnish with fresh berries. This dessert can be kept refrigerated for various hours, but it’s best to have soon after making to enjoy all the rich flavors. You can easily create vanilla pudding by skipping the cocoa powder in the recipe. If you replace the brownie for a 'blondie,' the results will be slightly different but just as delicious! Try dressing this dessert with butterscotch sauce and a little sea salt for a completely different sabor! I've got two questions for you. Do you like to prepare desserts for Christmas? And do you know anyone who can resist a sweet and creamy dessert with brownie chunks covered in decadent layers of chocolate pudding and whipped cream? I have to confess that I would rapidly succumb to this temptation. 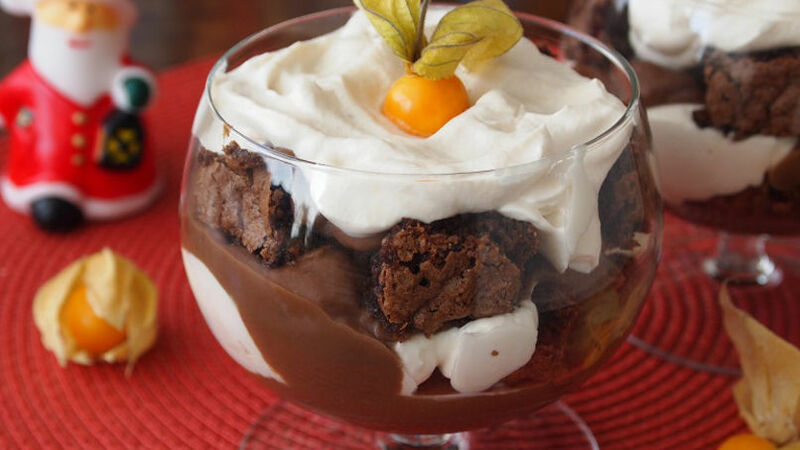 And if you would too, I have a marvelous brownie trifle recipe ready to share with you. I don't want to deceive you, though, by claiming that this trifle is easy to make. To create this dessert there are three sets of instructions: one for preparing the brownie, another for creating the pudding and a third for the whipped cream topping. Of course, all of these parts can be purchased ready-made and placed in a fancy glass, but for such a special day the idea is to create a delicioso treat made from your own lovely hands. Think you're up to the task? I know that during these days it's nearly impossible to find extra time, but I'm going to let you in on a little secret. Two days before your holiday dinner, you can prepare the brownie listed in this recipe. Then make the pudding the night before and keep it refrigerated. The cream can be whipped at the last minute and the dessert assembled shortly before the guests arrive–there's no need to fit all the cooking into one day! This spectacular Christmas trifle will be the center of attention and crown you queen of the evening.